It’s unbelievable but the idea for Cushing’s Help and Support arrived 18 years ago last night. That’s a long time for anything online. I was talking with my dear friend Alice, who ran a wonderful menopause site called Power Surge, wondering why there weren’t many support groups online (OR off!) for Cushing’s and I wondered if I could start one myself and we decided that I could. The first website (http://www.cushings-help.com) first went “live” July 21, 2000 and the message boards September 30, 2000. Hopefully, with these sites, I’m making some helpful differences in someone else’s life! The message boards are very active and we have weekly online text chats, occasional live interviews, local meetings, email newsletters, a clothing exchange, a Cushing’s Awareness Day Forum, podcasts, phone support and much more. Whenever one of the members of the boards gets into NIH, I try to go to visit them there. Other board members participate in the “Cushie Helper” program where they support others with one-on-one support, doctor/hospital visits, transportation issues and more. Of course, we now have a Facebook page and 2 groups. Both are secret, so if you want to join, please email or PM me for an invitation. Cushing’s News Feed This is also found on the right sidebar here. 2 Secret Groups. If you want to join, please email or PM me for an invitation. 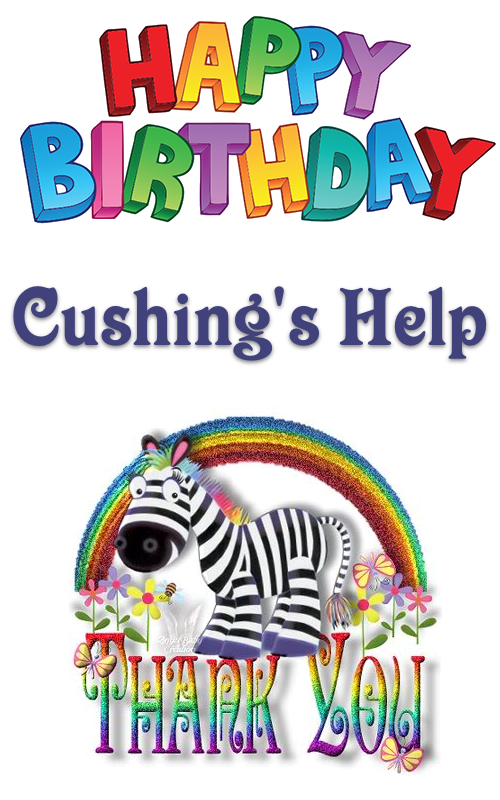 Here’s to another year of Cushing’s Help and Support!